Why would I need self storage in Olympia, WA? There are a variety of reasons why you might need self-storage in Olympia, WA. How much is a storage unit in Olympia, WA? The cheapest storage unit in Olympia, WA is $46.00 per month. What size storage units do you have available in Olympia, WA? In Olympia, WA we have sizes that range from 5'x5' to 10'x30' to suit your storage needs. How much is it for a 5'x5' storage unit in Olympia, WA? The cheapest 5'x5' storage unit in Olympia, WA is $55.00 per month. Olympia is the capital of Washington, and while it may not be the state's most populated city, it offers all the benefits of a state capital with the charm of a small town. Over the past few decades, the population has increased significantly, making it one of the fastest-growing areas in the Evergreen State. As a resident of Olympia, you'll find there's plenty to see and do throughout the city, as well as plenty of convenient amenities. The revitalization of the East Bay District has resulted in its transformation into a popular destination for locals and visitors alike. This once industrial area is now home to the Hands On Children's Museum, which provides interactive exhibits and education activities for children of all ages. The 13-acre East Bay District is pedestrian-friendly and intended as a mixed-use development area that blends commercial and retail options, tourist destinations and educational facilities. Another unique feature of the city is its Neighborhood Crossroads Program, which was created with the goal of fostering a greater sense of community. Gathering places or neighborhood nooks, intersection paintings and other creative installations are meant to enhance community identity. Some neighborhoods have already created these highlights, while others are gathering ideas from residents for the project. Along with its expansive growth over the past several years, Olympia is conducting a major, long-term port renovation. This has a number of important implications for the city and its growth. The projected dredging will allow larger ships to reach the port, and the proposed increase to rail activity at the Marine Terminal will facilitate easier moving of cargo. All of this is good news for the city's economy and, in turn, the local job market. Between the state of Washington and the local government, there are nearly as many positions in the public sector as there are people who live in Olympia. Jobs also exist in health care, at Providence St. Peter Hospital and Capital Medical Center. In addition, the city's large mall provides plenty of retail positions as well. 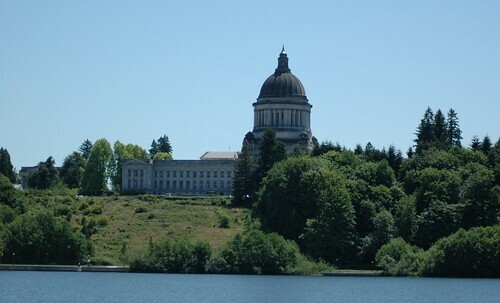 Olympia's designation as the state capital also nurtures a healthy tourism industry. With such a diverse economy, Olympia has a stable, growing job market that offers a range of job options. Olympia boasts one of the oldest school districts in Washington, founded in 1852. The school districts serving Olympia include the Olympia, Griffin and WA He Lut Indian districts. All three of the districts are very highly rated for their academic performance and parent satisfaction, which is good news if you're planning to enroll your child in one of the public schools. Utilities: Puget Sound Energy provides natural gas and electricity to the area, while the city's utilities department oversees water and sewer services. Garbage and Recycling: Trash and recycling are both collected on a regular basis. Generally, your collection schedule will depend on your home's location in the city. Transportation: The Intercity Transit Bus operates several routes around town, as well as a Dash shuttle and car pool services. Even though Olympia is the state capital, its housing market remains fairly affordable. The city is far more budget-friendly than the major city of Seattle, even though the median home price in Olympia is well above the national average. You'll find a variety of housing options to choose from, however, so it shouldn't be too challenging to find something to fit your budget. Our lowest priced units in Olympia, WA average $50.50 per month. 118 people have reserved units in Olympia, WA in the past 30 days. There are 2 locations within Olympia, WA's city limits.